Raleighites sit all over City Plaza waiting to watch a movie on a large inflatable screen. July 2016. I’m sure you, like me, have heard it all the time from those that worked in downtown Raleigh in the 1980s or even the 1990s. I get this all the time from those who tell me stories about how huge the ongoing revitalization of our city center really is. Through the eyes of downtown workers who’ve been here for decades or just Raleighites that have been around for awhile, the supposed “death” of downtown was official. For me, the opening of Fayetteville Street on July 29, 2006, was the day downtown woke up again. 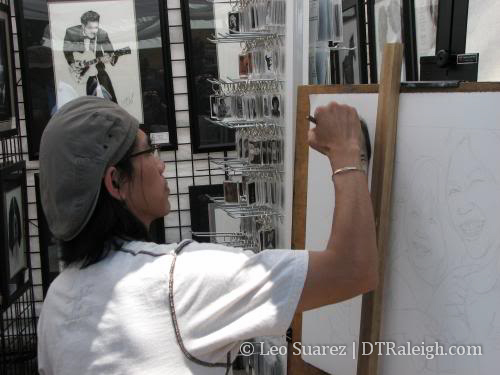 The Raleigh Wide Open event that day had tens of thousands of people on Fayetteville Street. Downtown supporters were hopeful that things would improve. Now you could argue that downtown wasn’t ever truly dead. There were still some bars and Artsplosure has been hosting large festivals since 1980. I wasn’t in town to experience this first hand so I’d love to hear more about downtown Raleigh in the 1970s, 1980s, and 1990s in the Community. However, when you look at investments in development, new retail and restaurants, and the rise of a residential population, things like these seemed to have happened in the mid-2000s. The Fayetteville Street reopening, along with a new convention center, marks the inflection point where downtown growth started to really rise. To keep things hot, events seemed like the tool to drive the crowds through the downtown real-estate “butterfly net”. 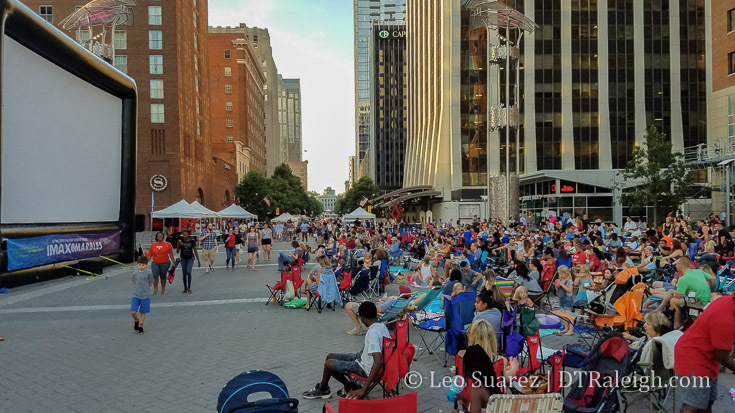 Fayetteville Street was and still is, built for events with easy to use power hookups, nearby parking for thousands, the widest sidewalks, and a killer street view. 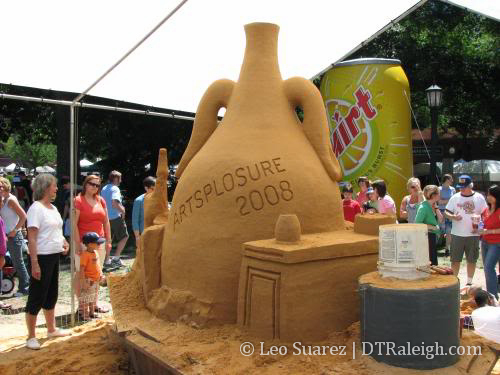 It may still be the center stage of outdoor events in Raleigh. Since 2006, I’ve watched events come and go with more and more piling on to the downtown streets. It seemed like a good thing as more restaurants opened, more retail opened, and the resident population continued to increase. We were doing something right, no? Somewhere between then and now, it seems like we got good at this downtown event thing. Almost too good and rumblings of too many events started to creep into the downtown dynamic. Streets were closed too often they said. The events were too noisy they said. Downtown was overrun. So they said. The city was the first one to back off a bit with the growing Raleigh Wide Open event, the one that kicked everything off, being discontinued. We didn’t need it anymore and the event sort of ran its course was the logic behind it if I recall correctly. It seemed fine because locally everyone was talking about how many events there were in the warmer months. (a lot) May and September are power event months, still, in downtown Raleigh and numerous food truck rodeos, beer festivals, and marathons would kind of fill in the rest. We also once had a huge water slide in Glenwood South. 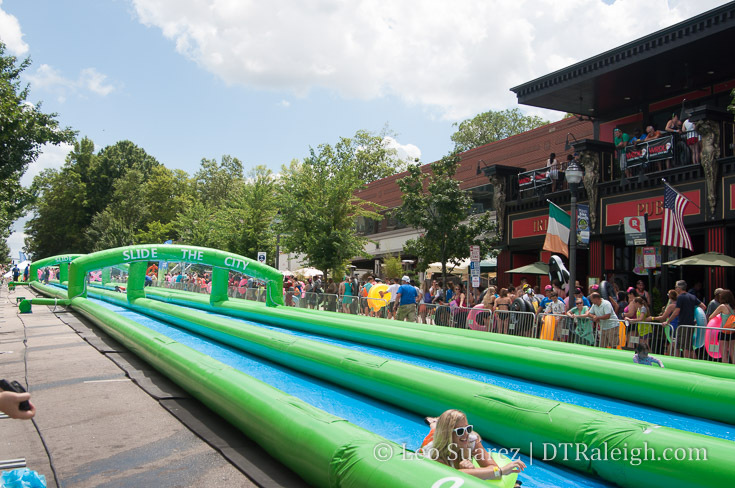 Slide the City event in Glenwood South. May 2015. Now let’s be clear. My headline isn’t meant to say that events are no longer welcome or needed in downtown these days but rather, events aren’t what’s making downtown anymore. We’ve done it. This downtown thing has stuck and a foundation of people-centric, downtown activities has infused itself into the city’s culture. There’s less need for closing downtown streets, blocking sidewalks, or continuing to pour effort into events. Now that the foundation has been laid it’s time to build on top of that momentum. This year, the city moved its July 4 fireworks party from downtown back to the fairgrounds. 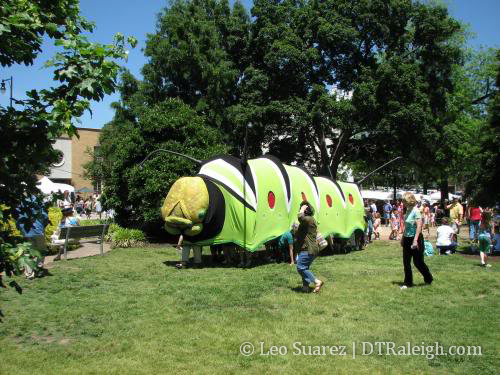 The Downtown Raleigh Alliance (DRA) has moved its Wednesday Farmer’s Market to Market and Exchange Plazas, activating a pedestrian space while keeping City Plaza free for natural interactions. I’m not a runner but I wonder if the number of marathons in Raleigh has leveled out with the Rock ‘n’ Roll marathon series and the Ironman triathlon ending their run this year. Over the past two decades, a special events strategy and focus has helped fuel the revitalization of Downtown Raleigh. However, as the community has grown, the impact of special events to those stakeholders generates a mix of opinions and positions. Public input regarding events is varied – however, there is a strong indication that Downtown’s success in attracting and hosting events could use a more empathetic, collaborative approach that acknowledges that events can cause disruption and inconvenience to some area residents, business owners, and people visiting Downtown to worship. Additionally, there is an appetite for intermittent, smaller scale activations – particularly in neighborhoods such as Glenwood South – as opposed to an expansion of major events that involve road closures. With only so many key event weekends, now all filled up, the downtown event “marathon” has matured. We have a sizeable downtown population that’s taken root and downtown workers keep coming. What might be the next layer on top of this? Could transit be the next rise over the next ten years? As the Wake Transit Plan comes along through 2027, downtown Raleigh plays a critical role. I believe that to be serious about transit, bus routes will need to have priority and with higher frequencies, you can’t have streets constantly being closed. The opening of Raleigh Union Station may start the wave of rail transit into downtown and it’s complimentary bus station may push that even further. Will the downtown resident population become more organized and vocal over the next ten years? The coveted downtown grocery store will finally land, twice, with Weaver Street Market coming to The Dillon and Publix coming to Peace. (Smokey Hollow) Housing is becoming a hot topic so maybe we’ll see denser development around downtown as a way to support the transit that’s coming. The point is that events aren’t seen as the revitalization tool it once was throughout the late 2000s, in my opinion. Downtown Raleigh is looking for its next big boom to build on top of that and continue growing. 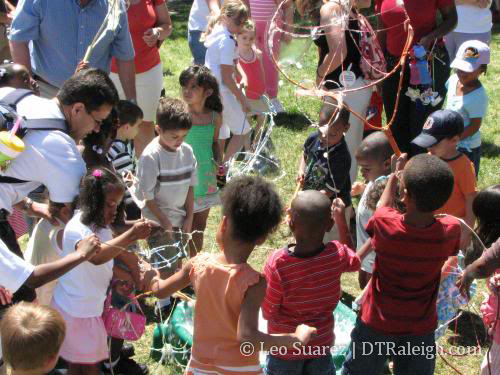 Come discuss downtown events on the DTRaleigh Community. Planning is fun but so is getting out in our downtown. This year’s Winterfest will be on Saturday December 5 and it will include a whole list of activities. There will of course be the ice rink, Raleigh’s only natural ice rink which runs up through the end of January. The December event will include a tree lighting, live music by Raleigh’s own American Aquarium, food trucks, and more. The center of it all takes place in City Plaza. Thank you to the City of Raleigh and Downtown Raleigh Alliance for putting it all together. Date/Time: Sat., Dec. 5 from 3 p.m. to 10 p.m. I know I posted about taking some time away from the blog but I haven’t left Raleigh just yet and I had some time to put some thoughts together on something that I’ve been thinking about. I went to lunch with a friend this week and we got to talking about the many events that come to downtown Raleigh. Now is a great time to talk about events because if you aren’t aware, downtown Raleigh ROCKS in September. We are at the start of the weekend after weekend after weekend event marathon and for residents like me, you notice all that activity taking place. From my point of view, talking to other downtown residents, the vibe is a “hesitant welcome” to these events. On one side, all that activity leads to a better downtown with more restaurants, more retail, and more entertainment. On the other, it can bring fatigue when streets are closed every weekend, droves of people buzz around the streets, and noise vibrates the buildings all around us. Here’s a schedule of some of the larger events, ones that shut down streets and such, that took place already or are coming up. Quite a bit of activity going on in and around September. That’s six weeks of Fayetteville Street closures. I didn’t even mention other events taking place like La Fiesta del Pueblo (9/8) in Moore Square, The Raleigh International Festival (10/4-10/6) at the convention center, and numerous Innovate Raleigh related event like Triangle Entrepreneurship Week, CED Tech Venture Conference, and DataPalooza. These events take place indoors but still bring activity to downtown. There’s also a similar event string in the Spring with lots of others sprinkled throughout the year. Road races, corn hole tournaments, food truck rodeos, parades, the list goes on and on. However, the diversity of these events must be appreciated greatly by residents, and all Raleighites really. It keeps downtown interesting and inclusive to everyone. There are hundreds of other events throughout the year and we’re getting close to having at least one of them touch anyone’s interest no matter how niche it may be. I remember talking to an area music club owner years ago. He told me once, “If you run a club like it’s your own personal jukebox you’re going to fail.” That sentence has stuck with me for awhile and I think it applies here. In my opinion, our success in downtown is in part due to the diversity of events taking place. I hope for a long time that downtown continues to be a jukebox with a variety of tunes. If our jukebox starts to sound the same, we know we’re in trouble. If a tune is playing that you don’t like, then sit that one out because one you will like is bound to play soon. Raleigh, the jukebox of the south! Raleigh Twestival from Kipp Bodnar on Vimeo. An introduction about Raleigh Twestival (http://raleigh.twestival.com) an event to raise money for Charity Water. This Thursday, February 12th, over 100 cities across the world are holding meetups for Twestival. This is a 100% volunteer event where 100% of the funds go to charity: water. There are still some tickets left, costing $11.40. Here’s the key info from the Raleigh Twestival webpage. The Glenwood-Brooklyn Neighborhood Association is sponsoring this event and it benefits the local Boys & Girls Clubs of Wake County. Here is a relevant N&O article. RALEIGH, N.C. – On Saturday, July 26, 2008, the Historic Glenwood-Brooklyn Neighborhood Association (HGBNA) will host its fourth annual “Downtown Appetite for Art.” Raleigh’s most popular summer charity event will once again showcase local artists and businesses that have joined together with their downtown neighbors to support the Boys & Girls Clubs of Wake County. Tickets are $50. Visit www.da4a.net to purchase. Tickets purchased at the door will be $100. Last year, “Downtown Appetite for Art” drew more than 550 participants and raised nearly $65,000. For the third year in a row, the event raised funds to provide financial support for the entire Boys & Girls Clubs’ visual and performing arts program, serving more than 4,000 area youth from its seven locations. For more information about attending the event or becoming a sponsor, please contact Roy Attride at roy@da4a.net, or 919.389.6726. The mission of the Boys & Girls Clubs is to enable all young people, especially those who need us most, to reach their full potential as productive, caring and responsible citizens. Open every day after school and on Saturdays when kids need positive, productive outlets, the Boys & Girls Clubs fill the void with structured, enriching and exciting after-school programs. Just like last year, Moore Square will be the stage for a handful of cinematic experiences this summer. When the sun sets, bring your favorite lounge chair or blanket to this free event. You can look forward to a new movie every other Saturday. Here are the movie listings and dates. 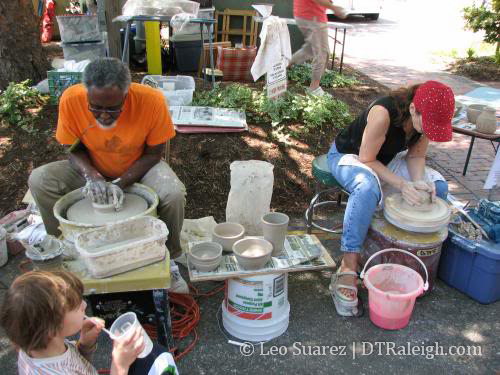 Here are some pictures from the weekend long Artsplosure event in downtown Raleigh. This was the 29th straight year the event has been held.